Grohe offers a wide range of showers. Whether you call it a shower head or a rain shower, Grohe has something for everyone. 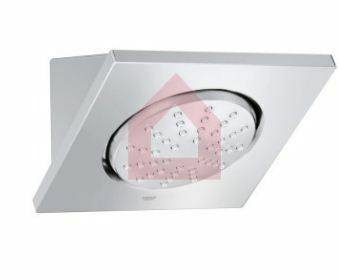 Our range of showers are made up of superior quality and are suitable for any place. Easy to install and maintain, these elegant showers will definitely add value to your home and bath. Hanuman Enterprises (India) Pvt. Ltd.
At Decorals, we wish to give customers a wide selection of amazingly priced Bath and Interior solutions with a consistently great shopping experience. Finding its first steps as Hanuman Enterprises and a reputation of highest quality standards, aesthetics and with the intent of providing world class products for over 25 years, we bring you Decorals. As a one stop solution, Decorals offers wide range of high quality products, design consultancy and paid installations. We aim to be India’s into a ‘Complete Bath and Interiors Solutions’ enterprise! Decorals has diversified options in various bath verticals like Sanitary Ware, Bath Fittings, Designer Sinks, Showers, Kitchen and Bath Accessories. . Our managed marketplace model is an ideal platform for small and medium businesses who wish to sell their merchandise & also for designers to share their expertise to millions of discerning customers. At Decorals, we aim to give you the access to the best products across India through our website. We also realized that there is void in the e-commerce websites when it came to purchasing Bath and interior fittings. Decorals is the ‘One-stop solution’ for all the decor needs for a home and Bath across India. Incomparable product portfolio in terms of design, availability and quality sets benchmarks for our selected product portfolio. We believe in upholding the standards of all that we offer our customers. And you get what you want with no hassles. We have a culture of putting the customer in the center of all that we do. Your needs and choices make us want to better ourselves. Our pricing and services are all at nominal prices to keep your requirements and necessities in mind. After all, we are who we are because of you. Our customer.